UPDATE 12-30-06 11:50AM McGuff has peacefully slipped away into the arms of the ever present Scottie Angels and traveled to the Rainbow Bridge... Run and play young man. The pain is gone. UPDATE 12-30-06 McGuff was seen by his Doctors this morning. The news was devastating. He has a fever and is loosing control of his left rear leg (which the Surgical Specialist had told us to be watching for. It is a sign the Cancer is spreading into his spine). His breathing is quite labored and he is refusing food. UPDATE 12-30-06 We feel McGuff should visit his Doctors today. He has been having some breathing difficulties since 5.00AM. More information to follow. UPDATE 12-29-06 McGuff's appetite is not as strong as it has been. At times he is refusing to eat anything except a small treat. He continues to go outside on his own, but never putting any weight on his left front paw. He is receiving pain relievers, but is not exhibiting any pain unless the mass is disturbed, which of course we avoid doing. UPDATE 12-25-06 McGuff slept well last night, after some initial restlessness. He enjoyed some bits of steak and gravy on his Christmas meal today. He continues to be mobile and able to go outside on his own, but still does not put pressure on his left front paw. UPDATE 12-23-06 McGuff had a rather restless night last night. He didn't seem to be able to get comfortable until about 3.00AM. We were with him all night long and he laid in my lap for quite a long time, enjoying the closeness. Then about 3.00AM, he finally dozed off and didn't wake up until 7.30AM, ready to go outside and then return to bed for treats and breakfast. He's done well all day long, asking to go outside several times. Hopefully, tonight will bring him a full night's rest. UPDATE 12-21-06 Today, Mr. McGuffin was seen by our Veterinary Diagnosis Specialist and our Veterinary Surgical Specialist. McGuff has a very aggressive malignant tumor in his left axillary area. Because of its' location, surgery is not a viable option. Amputation of the left front leg would be required, yet not all of the cancer cells would be able to be removed, even with this drastic surgery. McGuff is resting at his foster home and under constant watch. He is taking pain medication and has a strong appetite. He is still able to go outside under his own power. His condition will be re-evaluated daily. McGuff has now entered our Hospice Care Program. UPDATE 12-20-06 McGuff is being referred to our Veterinary Oncologist. Once the appointment has been made, we will update with more information. UPDATE 12-19-06 McGuff returned to the Vet today after we noticed an increase in the size of the mass over the past 12 hours. Cells were aspirated from the area and have been diagnosed as Cancerous. It is thought the lymph nodes are involved. We are now waiting for the results of blood panel studies that have been sent to a specialty lab. UPDATE 12- 18-06 McGuff has been seen by our Vet. X-rays were taken with no obvious problems noted. However, McGuff has a very deep mass under his left arm pit, in an area with many nerve endings that is causing the pain. He was given a pain reducing injection and anti-inflammatory meds. It is feared this is a tumor that is unable to be surgically removed. He is being carefully watched at his foster home for the next few days. We may very well be seeking the advice of our Veterinary Specialists. UPDATE 12-16-06 McGuff began limping on his left front leg this weekend. No source of the pain could be found (no nail breaks, no burrs in his feet or other areas of pain). He will visit our Veterinarian on Monday. UPDATE: 11-15-06 McGuff has developed two small skin lesions near the area where the previous tumor was located. The Pathologist has suggested treating them with low doses of Prednisone, which we are now giving him. UPDATE: 7-27-06 The final pathology report has come in after having several repetitive "staining" tests on the tumor samples. It appears that McGuffin's tumor is of a hystiocytic type, which are usually benign. However, we have been cautioned that these results are not 100% certain. There is a possibility of the masses recurring and/or a malignancy being present. We have been told to keep a watch on his skin for any changes. UPDATE: 7-20-06 The Pathologist has now narrowed the scope of his search from 4 different scenarios, down to two. It will be next week before we know the final analysis, but it appears that McGuffin is going to be battling Cancer. As we receive more information, we will continue to update this page. Suffice it say, our hearts our broken, but perhaps there is still a glimmer of hope for this young man. UPDATE: 7-18-06 McGuffin had his stitches removed today. His surgical scar is healing nicely. We were informed of yet another delay for the pathology report on the tumor samples that were sent out on July 6th, after his surgery. The samples have now been transferred to a 2nd laboratory in Colorado for analysis. We have been told the results will be available on Thursday, July 20th. UPDATE: 7-11-06 McGuffin had surgery on 7-6-06 to remove the mass on his left side. A 2nd mass was also found and removed. The pathology has come back and it indicates a Round Cell Tumor. This is a class of tumor that can have benign and malignant types. Unfortunately, the routine pathology by microscopic exam is unable to differentiate the type specifically. The pathologist recommends doing some special staining procedures for further identification, which we have approved. We're hoping to receive these results before the end of the week. Please keep McGuffin in your thoughts & prayers. 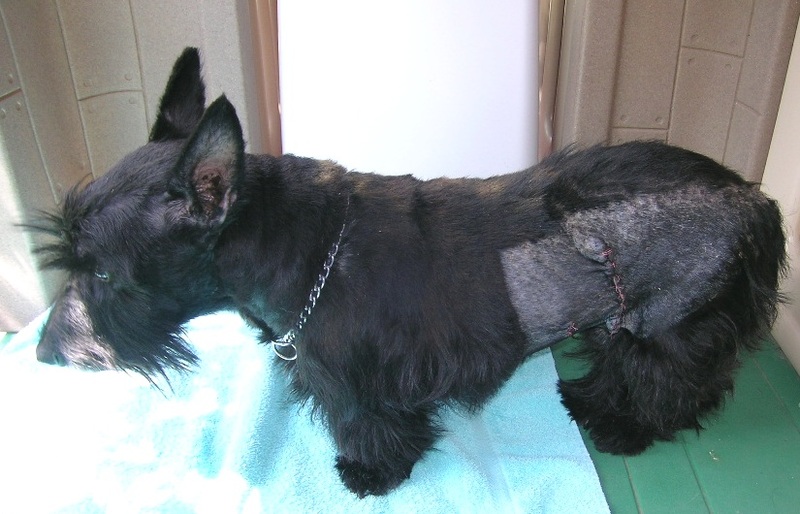 We recently received an urgent plea from a Scottie owner, asking for help with McGuffin. He has a large mass on his left side that requires surgery. They were unable to afford the surgery and turned to us for assistance. McGuffin is quite a trooper. It doesn't matter to him that he's facing major surgery, he still has a great, friendly attitude! The day McGuffin was surrendered to us, he had a complete medical exam, with blood work. The mass was aspirated and we're now waiting for the lab results. Surgery for removal of the mass is scheduled for July 6th. McGuffin is just 7-1/2 years old and certainly deserves to have the medical treatment he needs. Are you able to help him?